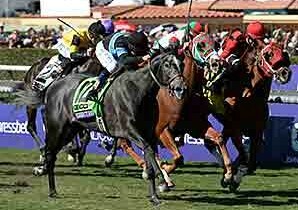 Four Star Sales / Posts tagged "Mizdirection"
When the World Championships are renewed for a third straight year Oct. 31-Nov. 1 at Santa Anita Park, missing from the lineup will be one of the most dynamic Breeders’ Cup winners of the past two years—two-time Turf Sprint (gr. IT) winner Mizdirection. 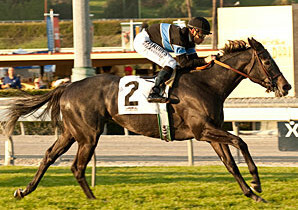 Four Star Graduate Mizdirection won the Breeders’ Cup Sprint today at Santa Anita. Odds-on pick Mizdirection, posted her fifth consecutive win on the hillside turf course at Santa Anita Park when she captured the $100,000 Las Cienegas Stakes (gr. IIIT) April 13. Mizdirection has now moved in 3rd place on the All-Time Four Star Graduate Money Earnings list behind Hystericalady and Uncle Mo with $1.15 million in career earnings. 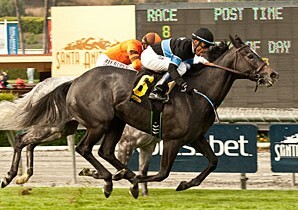 Only one result ensues when Mizdirection runs on the turf course at Santa Anita Park—win, win, win. Four Star Grad Mizdirection provided a rumble in The Jungle at Santa Anita Park on Saturday, taking the $1 million Breeders’ Cup Turf Sprint in a thrilling stretch drive in near-record time.